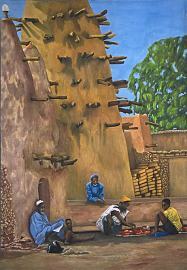 Traditional houses in the Sahel region of West Africa are built with adobe. This quilt represents a mosque I saw in San, a village in northern Mali. It is a typical example of the beautiful mosques that are found throughout this area. Mosques are often built in the center of the villages and become a gathering place for all kinds of activities. Once or twice a week, local butchers will sell meat in front of the mosque.